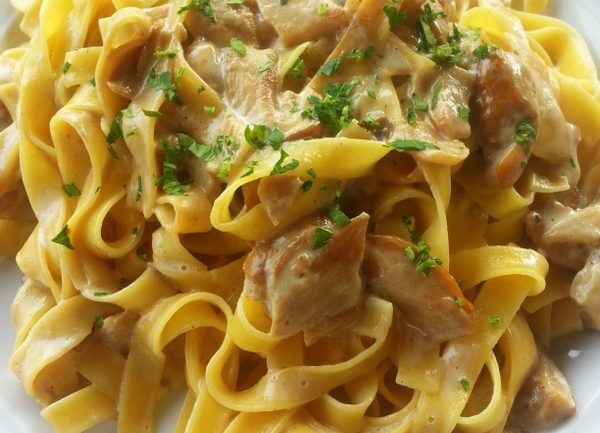 Tagliatelle or Fettuccine? What is the difference? 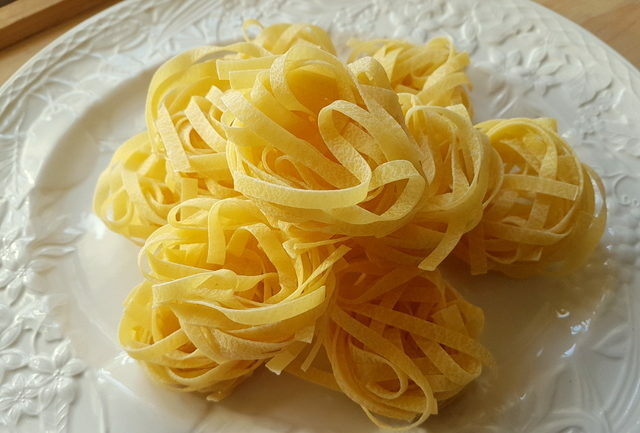 Tagliatelle is an interesting type of pasta for 3 reasons. 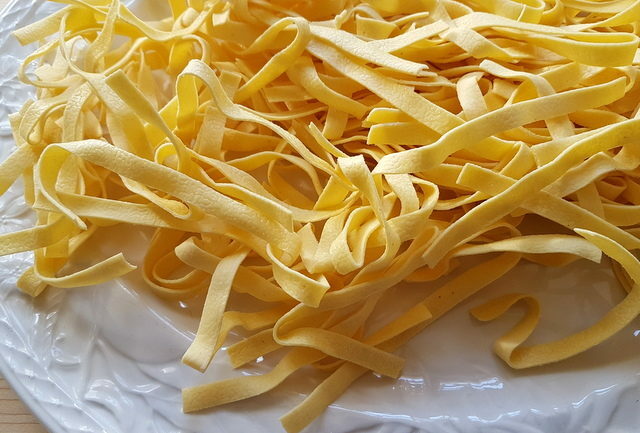 Firstly, in order to be called tagliatelle these pasta ribbons have to have a particular width (normally 6-8mm wide). Make them too narrow or thicker and they could become fettuccine! Thinner still, and you may end up with bavette or tagliolini! Make them too wide and they will turn into pappardelle! Secondly, according to legend, this pasta has a rather romantic origin. 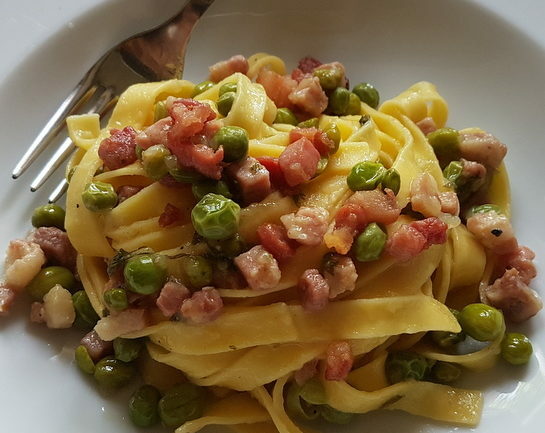 There is a story that tagliatelle was invented in 1487, when Giovanni II of Bentivoglio, at the time Lord of Bologna, asked his chef to prepare a banquet in honor of Lucrezia Borgia. Lucrezia was due to visit the city on her way to Ferrara to marry Duke Alfonso D’Este. Bentivoglio wanted to honor the bride-to-be. The chef, Mastro Zefirano, apparently cooked an unforgettable banquet, which included a new type of pasta made by cutting classic lasagne into long golden strips of pasta in honor of the bride’s legendary blonde hair . This pasta became known as tagliatelle! 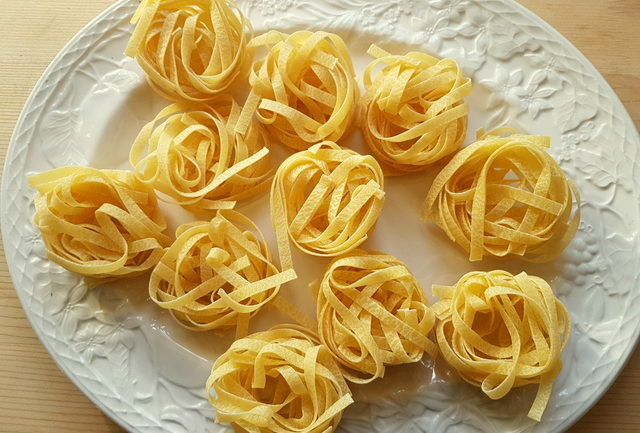 Whatever its origins, the name tagliatelle almost certainly stems from the traditional way of making these pasta ribbons. This is usually done by rolling out the dough into fairly thin sheets and cutting (tagliare in Italian) ribbons from them by hand. In the past, these ribbons were usually only cooked fresh. 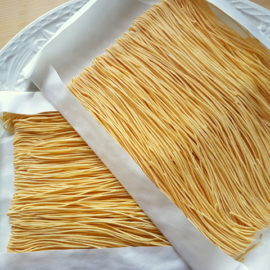 Today, many pasta companies make tagliatelle by extrusion and sell it dried as ‘nests’ of pasta. However, here in Italy, people still frequently make it at home or buy it fresh. Although believed to have originated in Emilia-Romagna, tagliatelle is a traditional pasta in most of North and Central Italy. 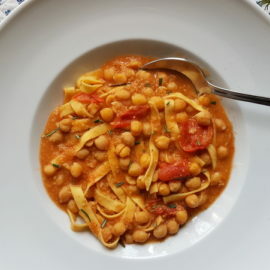 There are many traditional recipes for this pasta, particularly in Tuscany, Lazio, Umbria and Le Marche. This pasta was originally always made as an egg pasta. 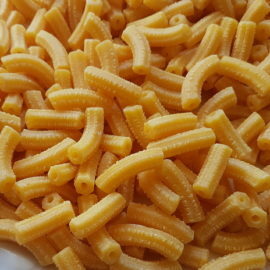 However, today, you can often find it available as a durum pasta, as well. Traditionally tagliatelle comes in two different colours, green and plain (yellow). The green version is often coloured and flavored with spinach or chard. 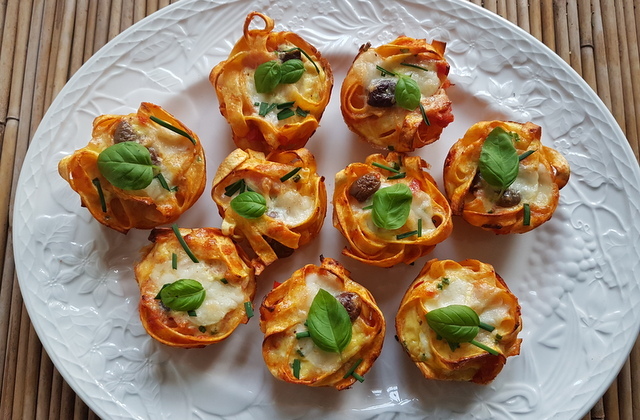 An important characteristic of this pasta is the texture, which is relatively rough compared with other types of pasta.In addition, the porous nature of tagliatelle also makes it ideal for soaking up some of the thicker sauces. with fresh peas and pancetta. Which brings me to the third interesting fact about tagliatelle! 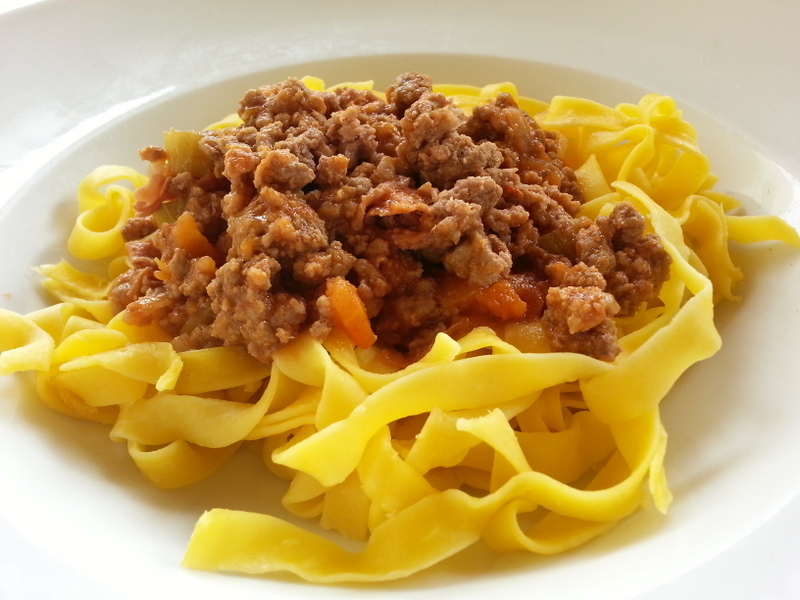 Despite the fact that everybody talks about spaghetti bolognese, traditionally tagliatelle is the pasta of choice for ‘bolognese’ in Italy. Bolognese sauce, needless to say, comes from Bologna. But, in Bologna, they don’t normally call it ‘bolognese’. They call it ‘ragu’, meaning meat sauce. 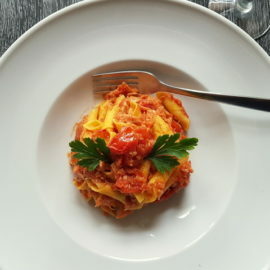 So, if you happen to be in Bologna and want to eat ‘bolognese’ look out for ‘tagliatelle al ragu’ on the menu, not spaghetti Bolognese!